Today I'm going to share another tutorial on how to beautify a blog and add more value by showing post summary below a blog post on blogger. This is very common on WordPress blogs using plugins, this can also be done on blogger too by using some few HTML codes. With this little trick, you can easily showcase article summary in the post footer. How Article Summary Widget Works. This widget automatically fetches a summary of an article by showing a short image snippet of the featured image in the article using data:post.thumbnailUrl and the article name using the <data:post.title/> tag, also the name of the post publisher using Google Plus profile. Lastly, it also adds a unique post description by fetching the custom post search description added through the post editor using <data:blog.metaDescription/> and also the labels used with <data:label.name/>. 5. Save Template and view any of your blog posts to see the article summary live. 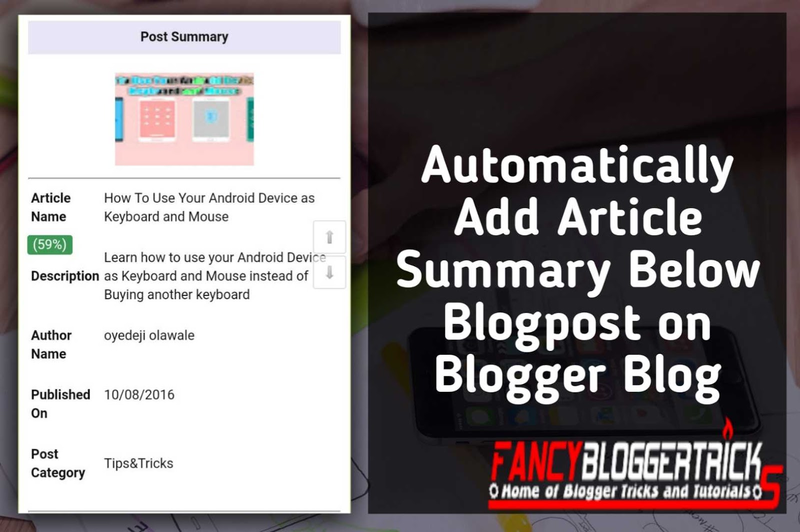 Adding article summary to a blog post add more beauty to a blogger blog and can also improve SEO, because more targeted keywords appear in the summary description and post title. Are you finding it hard to automatically add article summary below a blog post on blogger? Comment through the comment section and ill try to help you out.